A luxury traditional free-standing radiator with stylish ball joints, it's classic design would look great in any bathroom. Manufactured to the highest standards and constructed from strong chrome plated durable steel. It delivers excellent heat and is ideal for warming towels when in the bath or shower. Supplied with floor fixings. Q. Can this be connected to the system from it's outside edge rather than inside? Hi, no these are fixed into that position by the manufacture and are not adjustable. Sorry we couldn't help more today, if you require help choosing an alternative, please call our helpline today! 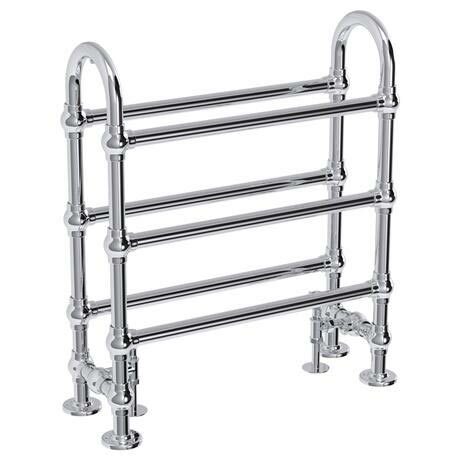 Hi, the Windsor Freestanding Towel Rail is suitable for all central heating systems. Therefore it is not electric. Thanks.